A new Design of Experiments application has been developed for the intelligent discovery of new catalytic materials when exploring a high dimensional space. It has appropriate tools for high-dimensional optimization but maintains in memory the whole "history" of the search. So, this software application could be used to reduce the screening of statistically-poor active materials. 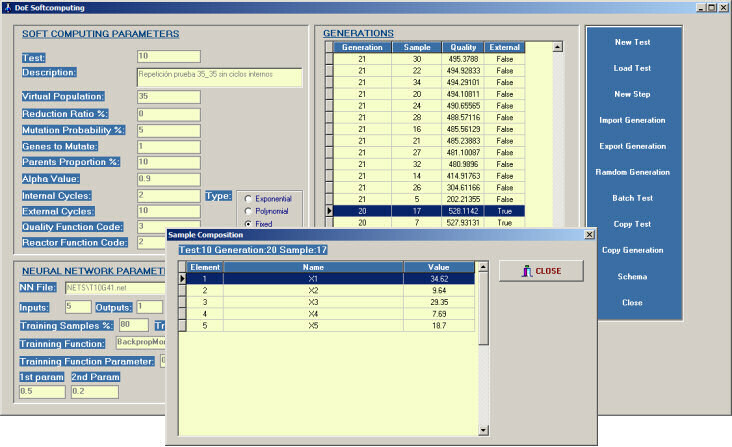 Actually, the optimization software application could be employed practically in the design of experiments, since (i) the reduced population size required by the application is in the range employed by material characterization/testing techniques and (ii) the fast converge exhibited by the developed tool requires a low number of generations to identify high quality areas in the search space. Therefore, the application of this soft computing system to high throughput experimentation would reduce development time and costs. Another important contribution is the new developed codification, which allows dealing with optimizations considering simultaneously complex catalyst formulations and different synthesis/testing conditions as variables, being possible to define different rules between variables. Moreover, although it was initially developed to be employed in catalysis, the codification is general enough to be applied to other fields such as materials science or drug discovery. Furthermore, the codification enables to carry out more deeper studies, not only optimizing the configuration of the samples, but also allowing the analysis of the elements that compose the samples (for example, identifying the elements that appear in the best samples more frequently, in which percentage, etc. ).